UNFI Chairman, President and CEO Steven Spinner was in Colorado recently to address the Naturally Boulder business community about the future of distribution in the natural, organic and “better for you” consumer products market. The takeaway: “It’s a good time to be in this space,” Spinner said. “We are one of the few industries other than tech that actually grows,” he said, noting that the natural and organic market is growing at 10% vs. 1% growth in conventional foods. 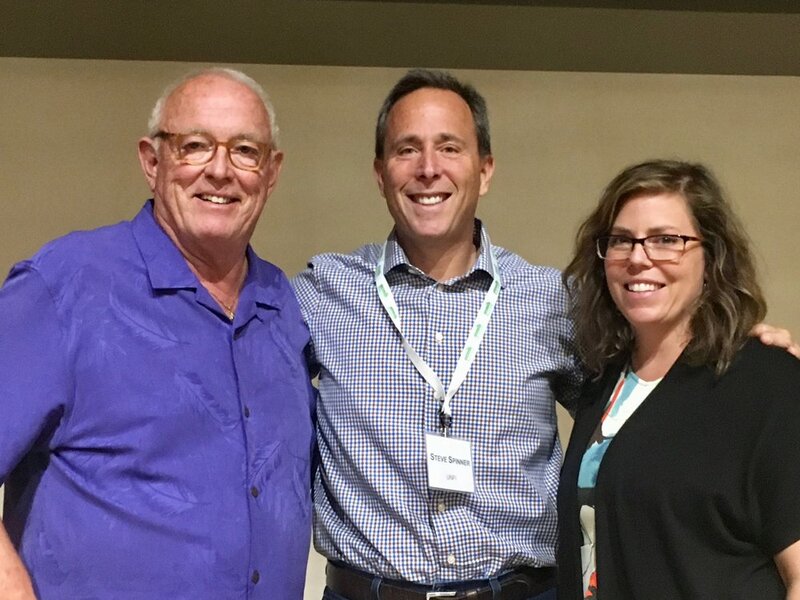 From left: Mark Retzloff, Cofounder, Alfalfa’s Market; UNFI Chair Steve Spinner; and Carlotta Mast, SVP of Content, New Hope Network, and President, Naturally Boulder. Yet, be prepared for change, Spinner encouraged. “Change is pretty good. The reality is those who have been in the natural products industry for a while have learned that in order to deal with all that growth, you’ve got to be comfortable with handling a great deal of change. Because UNFI is conservative, our balance sheet is conservative – we carry very little debt – and we can weather the changes,” he said. Among the drivers affecting the healthy lifestyles market, Spinner noted, “We are seeing consolidation among manufacturers and the maturation of retail. Also, consumer buying habits are shifting. People are living longer and buying homes and having children later. And with the growth of alternate channels, things are going to get more competitive, so be careful of the price you charge. The Internet has made everything more transparent,” he advised. “For us, our margins have come down materially year over year – 80% of our volume is a cost-plus program of 10% or less. A common misconception is that we make all this margin on the backs of our suppliers, but that is not true. The way we achieve income growth is by becoming more efficient – we seek to reduce our costs further than our contracting margins,” Spinner shared. While sales of natural and organic products are growing in mainstream stores such as WalMart, Costco, Kroger and others, “That’s not necessarily all bad because these stores are serving crossover shoppers, and then we get a committed natural and organic shopper,” he said. At the helm of UNFI – the largest distributor of natural and organic products in North America, with more than $9 billion in annual sales – since 2008, Spinner has become widely recognized as one of the top distribution and logistics experts in the food industry. A publicly traded company (Nasdaq: UNFI), UNFI serves 43,000 customers in the U.S. and Canada from 33 distribution centers. The company recently reorganized itself into three regions: Pacific, Central and Atlantic. Additionally, Spinner noted, “In the past manufacturers had to deal with a number of different regions and policies were different. We have now shifted to a single Supplier Relationship Manager (SRM) system in which the manager works with the supplier on promotional schedules, product introductions, etc. We encourage brands to build a relationship with their SRM. Ask them for advice, for help in resolving issues with deductions, pricing, anything. Even though our managers have to respond to many brands, you might want to make the trip to visit your SRM. It can improve your relationship with UNFI dramatically,” he added. “The perimeter is growing faster than the center of the store,” noted UNFI Chair Steve Spinner. Source: UNFI. UNFI serves all aspects of a retail store, what it refers to as “Building out the Store,” through its complete catalog plus private label brands including Blue Marble, Haddon House, Woodstock Farms, Select Nutrition and others. For the perimeter, UNFI serves retailers through its subsidiaries Albert’s Organics, Tony’s Fine Foods and Gourmet Guru. A recent acquisition, Honest Green, also provides UNFI with the ability to drop ship over 35,000 products on behalf of small and national retailers that want to offer a broader range of items beyond their shelves, plus other non-traditional accounts that want UNFI products. For established national brands, UNFI’s fee-based ClearVue program converts a brand’s total distributor promotional spend into one flat rate – “No more deduction surprises, and a tremendous amount of portal information available,” said Spinner, who reported that close to 100 suppliers currently participate in the ClearVue program. To learn if your brand qualifies for UNFI Next, Spinner recommended contacting the appropriate regional Supplier Relationship Manager (SRM). To find contact info, visit here: http://yourbrandsmatter.com/srm-contacts/. You can also learn more about the UNFI Next program at UNFI’s Blog, October 2016 edition, here: http://unfisupplierupdate.blogspot.com/2016/.